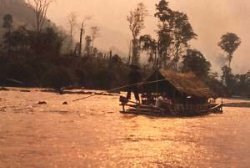 The highlight of this guided tour is the scenic stretch of the Mae Kok River, which will be traveled in two days, mostly on a bamboo raft with accommodation at the Lahu Lodge. This tour includes also a day tour through the Golden Triangle area. Pick up from the airport or hotel. Depart Chiang Mai and travel out towards north. Have a first stop at a local market in the country side. 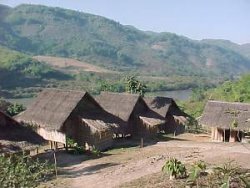 Drive on some back roads to visit one of the rare Palong hill tribe villages and a cave temple. Another short stop will follow at a rice mill. Just a bit above Thaton enjoy the great views to the Burmese mountain wilderness and the Mae Kok Valley from Wat Thaton and its giant Buddha images. Overnight at a resort on the river bank. Time for a morning walk through the village. Then depart Thaton and travel to a riverside Shan village. The women of this village are well known for their skills in weaving. Here you will board the bamboo raft for a lazy trip down river. On route you have the possibility to do short walks and visit some of the villages. 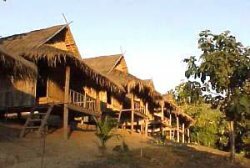 Late afternoon arrival at the Lahu Lodge. Very simple, but clean accommodation. 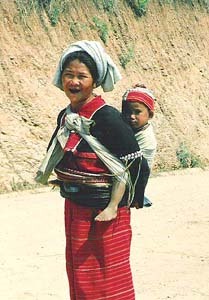 Enjoy the evening at the Lahu village and get in touch with these friendly hill tribe people. Continue downriver and stop briefly at some hot springs before arriving at a riverside elephant camp. After lunch set off for a one hour elephant safari. Then transfer by car to Chiang Rai , where you will check in at hotel for overnight. In the evening time to explore Chiang Rai's little night bazaar. Early morning drive for about one hour to the former royal town of Chiang Saen and enjoy a short boat trip on the mighty Mekong River to the Laotian river island of Koh Don Sao and further to the Golden Triangle, where the borders of Thailand, Laos and Myanmar (Burma) meet. Visit the Opium Museum. Travel to the border- and market town of Mae Sai and explore the bustling market. Optional side trip to Burmese border town of Tachilek can be arranged (border pass available). In the afternoon drive back to Chiang Mai with some stops on the way. Transfer to your chosen hotel or airport, depend on your further program. Air-conditioned transportation during the tour, English speaking tour guide, all transfers and excursions as mentioned in the above itinerary, accommodation 2 nights at very good middle class hotels and resorts, 1 night simple but clean bamboo hut at Lahu hill tribe village, entrance fees, half board (breakfast and lunch during tours), 1 dinner at Lahu Lodge. This itinerary can be done without the tour on the last day. In this case end of the tour on evening day 3 with connecting flights to Chiang Mai or Bangkok available, or just overnight in Chiang Rai and depart the next day. 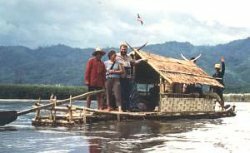 On Day 2 and/or Day 3 possibility to travel by motorized long tail boat instead of the bamboo raft. In that case, please let us know at the time of booking this tour.